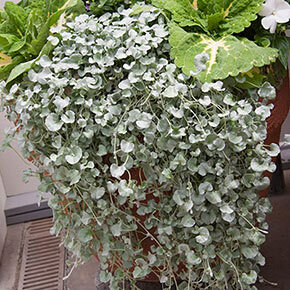 This dichondra is mostly grown for its dramatic silver-blue foliage. Long, spindly stems with little round leaves cascade over the sides of a hanging basket or stone wall like a shimmering waterfall. It is a joy to grow too, easy and fast. Though it does perennialize in zones 9 to 10, it's not a winter hardy plant. That's why we like it best as a container annual. In fact, if you're trying to complete the "spiller-filler-thriller" ration for your annual container garden, this is a fantastic choice for your spiller. Dichondra argentea 'Silver Falls' You may also like: Silver Falls Dichondra is featured alongside other enchanting in our Romantic Filagree Annual Collection. Flower Form: White, grown for the decorative silver foliage. 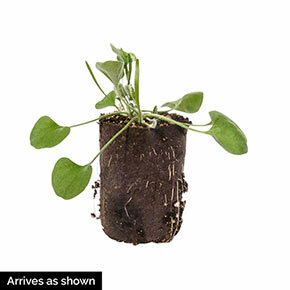 Foliage Type: Numerous tiny, cascading silver leaves that are rounded or fan-shaped. Velvety texture. Pruning: None necessary unless you want to control spreading. Soil Requirement: Fertile, well drained. Watering Requirement: Requires regular watering- weekly or more often in extreme heat. Tolerates mild drought when established.